The archaeological evidence of inscribed oracle bones found near Anyang in North Central China provide a written record of the religious divination practices of China's Shang elites (1554 - 1040 BCE) (De Bary 1999:4). Shang oracle inscriptions offer a Neolithic glimpse into the mind of Shang diviners illuminating their view of cosmology and metaphysics which not only served as a vehicle to legitimize the rule of the last nine Shang kings' rule (De Bary 1999:5), but also set into motion a theocratic stage for later Chinese traditions and dynasties. Shang pyromantic divination utilized animal bone as a medium and fire to predict the future. Taking an ox scapula (shoulder blade bone) or a plastron (bottom shell) of a turtle, Shang diviners carved or bored a series of holes or pits into the bone. Uttering an oral question or "charge", the Shang divine applied a hot bronze poker to these hollows or pits, causing the bone to crack. The pattern of cracks was considered a specific reaction from the spirits and interpreted by the diviner (Lopez 1996:42). The Shang king would then declare his prediction, "auspicious" or "inauspicious". The words of the charge were then inscribed into the bone in a large calligraphy denoting importance beside the cracks (Keightley 1988:373). Additionally, the name of the diviner and the date the shell or bone was cracked was also inscribe into the bone. A significant number of bone inscriptions included both a record of the king's prognostication and the outcome (Lopez 1996:42). 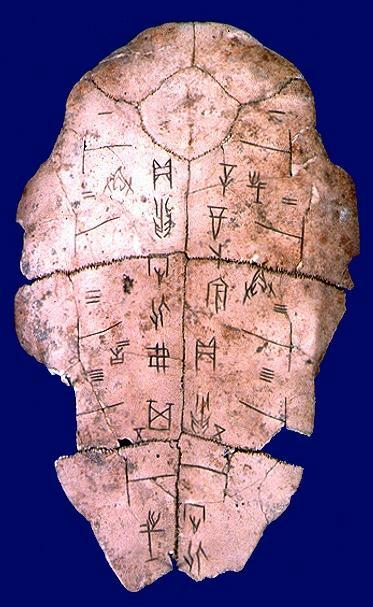 Oracle-bone inscriptions infer a picture of only elite Shang theology. Deciphering these written divination notes uncovers a religious logic and an orderly ritualistic system of rule (Keightley 1978:212). Shang cosmology included a pantheon of celestial powers, such as Di, the High God, who stood at the apex of the spirit world. The oracle texts show that Di was responsible for ordering rain or thunder, or affecting harvest, military campaigns, and even the king's health (De Bary 1999:11). Nature deities such as Yellow River, the Mountain, and Ri, the Sun (De Bary 1999:10) played minor roles in the inscriptions (Lopez 1996:44). The Shang embraced ancestor veneration-a hierarchical kinship that was a central to royal divination and underscored a spiritual alliance that bridged the worlds of living and dead. The ancestor cult required that the living king nourish his ancestors with millet-wine libations, grain offerings, and animal and human sacrifices (Lopez 1996:42). Many of the oracle inscriptions were questions regarding the number of cattle, sheep or humans to be sacrificed. These bribes honoured and appeased the ancestors, giving them strength to mediate on the king's behalf with the celestial powers, bestowing insight and influence to affect the Shang world (Keightly 1978:213). This not only created a strict ritualistic process stressing the importance of right conduct to the right ancestor on the right day-which was critical for the successful outcome of the Shang king's prognostication-but also reinforced the idea that the world was discoverable and manageable if approached in negotiable, quantifiable, contractual terms with one's ancestors (Keightly 1978:216). To gain insight, seek reassurance or declare his plans, the king divined all aspects of Shang life. The ability to discern reliable predictions and secure favourable results for his kingdom would sanctify the king as the "one man" who could affect the will of the ancestors, granting him the necessary psychological and ideological endorsement for political dominance (Keightly 1978:213). This Shang concept appears as the forerunner to the Zhou's crystallized, "Mandate of Heaven" notion. The Shang elites must have seen similarities in the Zhou conception of a supreme being, Tian, as head of the universe and akin to the Shang notion of Di as the apex of the cosmos. The ease and readiness with which the Shang accepted Zhou rule suggests that the "Mandate of Heaven" concept was familiar in Late Shang socio-political culture (De Bary 1999:23) Moreover, no oracle bone texts were found to record a king's inaccurate predictions. Statistically speaking, there should be some inaccurate prognostications suggesting that the oracle bones were a biased record of the king's divination abilities, serving to legitimize his rule (Keightly 1988:373). Shang divination held a strong magical component. The charge was not only uttered aloud, but also etched in the bone medium implying a kind of potency as if it were a royal spell or conjuration on a future outcome. Examples are well documented in the bone inscriptions, "This night there will be no disaster," or "the whole day there will be no rain" (Keightly 1988:372). These ritual incantations were not so much an attempt to foresee trouble, but rather a charm to invoke the magical power of an ancestor to thwart disaster and ensure the desired outcome (Keightly 1988:372). Charges varied from asking a question both in positive and negative mode to stating a wish or issuing a performative in a singular mode. Paired divination charges were complementary (Keightly 1988:373), "We will receive millet harvest", and "We may not receive millet harvest,"(Keightly 1988:374) suggesting the Shang diviners were dualistic in their worldview-"auspicious and inauspicious", "victory and defeat", "life and death", "good and bad" (Keightly 1988:374). It may also suggest that the divination ritual had more credibility by embracing both possible outcomes of either good or bad-a sort of metaphysical equity (Keightly 1988:375). Overall, this paired, complementary approach to the divination charge suggests an early yin yang view of the universe (Keightly 1988:377). Towards the end of the Shang dynasty, divination charges were singular statements of intent, as if the matter had already been decided by the king who was merely looking for reassurance or validation that his decision was correct (Keightly 1988:381). By the end of the Shang period, the content of divinations slowly degraded into a less important and more artificial process of ritual routine (Keightly 1988:381). The once bold inscription calligraphy became smaller, (Keightly 1988:382) less detailed and concerned mostly with the sacrificial schedule and general queries into the ten day period (Keightly 1988:381).There were no longer complementary charges, nor inauspicious predictions, only singular auspicious prognostications with no record of verified predictions, suggesting a change in the Shang diviners metaphysical thinking (Keightly 1988:382). It could be argued that early Shang culture was less advanced and perhaps more at the mercy of the elements, and subject to more negative results (Keightly 1988:388).As Shang society advanced it generated more positive results, the king pronounced only auspicious events. Rulers were more confident and in control of the world they lived in (Keightly 1988:388). Towards the close of the Shang dynasty, a shift in divination practice occurred from a pyromantic approach to a more complex and numerical form of divination using milfoil sticks (De Bary 1999:21). To argue that Shang divination was a ruse for the king to validate and maintain his theocratic role is a pessimistic view. It may have been one component of the diviner's intent because the oracle bone texts suggest the presence of manipulation, especially towards the end of the Shang period, but Shang divination delivered much more. The Shang elites established a highly ritualized, religious logic that reinforced certain cosmological and metaphysical beliefs, as well as a strong inclination for bureaucratic administration. The notion that a king's activities were subject to the approval of the celestial powers helped to legitimized the Zhou's smooth transition of rule and provided a divine foundation for future sages to guide their king towards more humane rule. Shang complementary positive and negative (yin yang) modes of reality would later take shape in the metaphysics of Daoist, Confucianist and Buddhist traditions. Divination, with its magico-religious qualities, continued with Zhou and endures today in popular Chinese magic and religious thought. In Confucian times, ancestor veneration helped facilitate ritualized filial piety, and ancestor worship is still practiced today in China. Overall, Chinese religious culture throughout the ages can trace its origins to the Shang elites and their establishment of a ritualized, religious logic of divination and its' accompanying metaphysics and cosmology. De Bary, Wm. Theodore and Irene Bloom, Sources of the Chinese Religion, Vol.1. Columbia University Press, New York, 1999. Keightley, David N., The Religious Commitment: Shang Theology and the Genesis of Chinese Political Culture. University of Chicago, Illinois, 1978.